When bidding is finished, one player, called the Declarer wins the auction by being the last to bid a contract. Declarer plays two hands at the same time: his or her own hand and partner's hand, now called Dummy. This is a big advantage to declarer! But of course the defenders can also see the dummy hand. Dummy is hidden until the player to the left of Declarer leads the first card. In the example here, Declarer is playing in the South seat and Dummy is North. West has just lead the first card and it's Dummy's turn to play a card. The yellow bar shows whose turn it is to play. 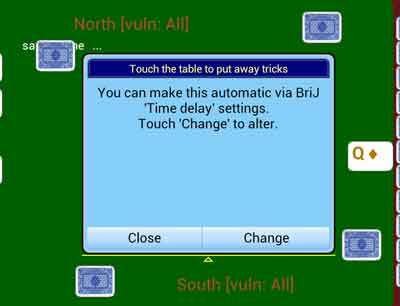 (A red bar appears when it's Brij's turn to play a card). In the same way as for bidding, you can touch the Hint tab to get ideas on what card to play. 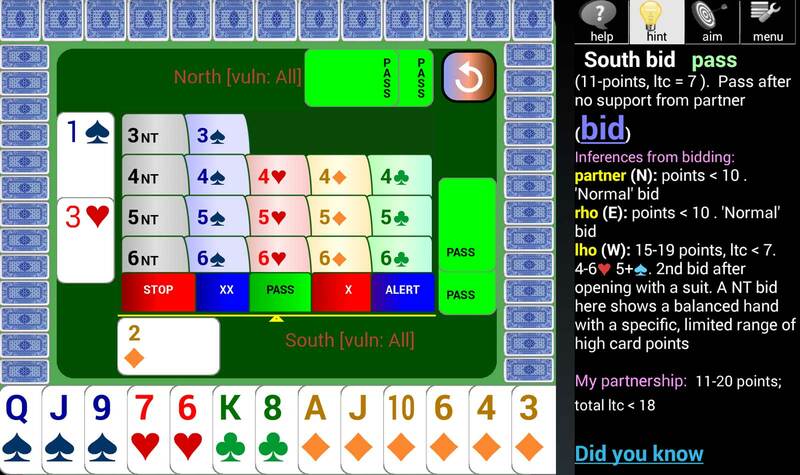 Information includes inferences about other hands, for example showing where cards are likely to lie based on the rule of 11 from a low lead card. Conventions that BriJ follows for opening leads, hi/lo signals to partner etc. are outlined in the BriJ Convention Card. You can also touch any card to see why (in BriJ's opinion) it was played. The contract display says what the contract is and how many tricks Declarer has won so far. At any time press Auto, Replay, Rebid or New. Auto starts automatic play, for example when you want to claim remaining tricks. Rebid goes back to the start of bidding for the same deal. New shuffles and re-deals the cards. When each player has played a card, a round of play ends and a trick is taken by the winning side. A trick is shown by the played card left face-down on the table, pointing towards the winning side. This is referred to as "putting away the trick". You may see a notice like this at the end of the first or second round. In BriJ, putting away is automatic, but you can vary the time cards remain visible at the end of the round. (See Settings). If this time is relatively long, you may wish to put away tricks at your convenience by touching the table when you're ready to move on. When you become more used to playing the cards, you may wish to reduce the delay time by touching the Change button. As in bidding, if you change your mind about a playing a card you have touched, slide your finger to one side before letting go. Alternatively long-touch the table for a menu to undo the most recent plays.